If your Whirlpool dryer won’t heat you will waste a lot of energy running your dryer for hours and your clothes just will not get dry. Fortunately this clothes dryer repair guide will walk you through the steps in repairing your dryer. These are the same steps I take in repairing dryers professionally. Read each section carefully until your dryer is repaired. If the vent is stopped up the dryer will sometimes still heat but will take a very long time to dry clothes. One of the signs that the vent is stopped up is the case of the dryer will get very hot but the clothes are not dry when dryer stops. Check the vent it may be clogged, crimped or it just may be too long (as a rule of thumb I like to keep it shorter than 25 feet if possible). Dryer manufacturers recommend under 60 feet but every time there is a 90-degree turn you subtract about 10 feet, so about 25 to 35 feet is all you can do. Vent stopped up can cause many parts to go bad so check your vent after repairing the dryer (no matter what was wrong with the dryer). Be sure to clean the lint trap each time you use the dryer. To check the dryer heating elements first you should unplug the dryer then access the element. On some models you access the element by removing the back and others you remove an access panel at front of the dryer below the door. Once you have removed the cover you should see the heater can. Unplug the heating element using your ohmmeter , check to see if you have continuity between the two terminals if you don’t then the element is bad and needs replacing. Also check to make sure the element isn’t grounded out. If the heater is grounded out the dryer can overheat and cause one of the safety thermostats to trip. A grounded heater can also cause the dryer to heat even when it is off which can be very dangerous. To check for a grounded heater, disconnect the wires from the element and test for continuity from the metal heater-can to one of the heater terminals. If you have any continuity from one of the terminals to ground (heater-can), the element is grounded out so replace the heater. 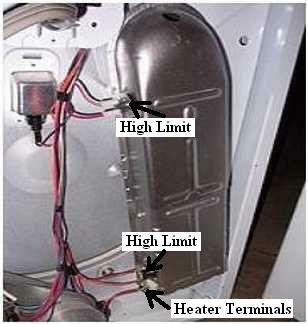 If the heater is grounded out, one of the high limit thermostats or the thermal fuse may be tripped and needs replacing. Dryer heating elements can be purchased at AppliancePartsPros.com. There are two high limit thermostats that cut out the heating element. In the event it becomes too hot, the vent being stopped up can cause this, so if the high limit thermostat is bad check the vent as well. To check the high limits, first unplug the dryer then remove the back. Once off you should see the heater can with the two high limits, unplug the wires from both of them. Using your ohmmeter , check to see if you have continuity between the two terminals of each of the high limits, thus if you don’t have continuity on either one replace both of them. Whirlpool recommends it and they come together in a package. This part can be purchased at AppliancePartsPros.com. Operating thermostats don’t fail often but when they do they can cause your dryer not to heat or overheat. 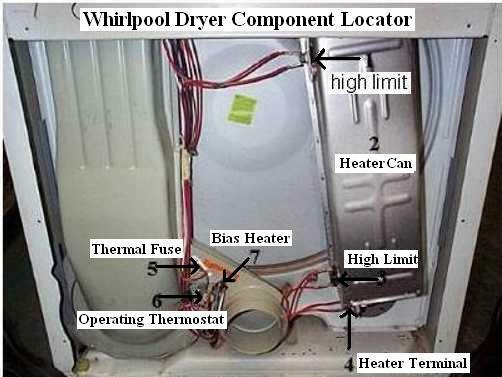 The operating thermostat can cause your Whirlpool dryer to stop heating. To test this, disconnect power to the dryer and disconnect the two outside wires off the thermostat, next test for continuity with an ohmmeter. If it is open replace it. Overheating can also be caused by a grounded heating element, see the section above titled dryer heating element for more information. If your Whirlpool dryer overheats there are three safety thermostats that are put in place to prevent dryer fire, two high limit thermostats and the thermal fuse. The thermal fuse will shut down the dryer completely and the high limits will only prevent the heating element operation. If the operating thermostat sticks closed the dryer will heat indefinitely eventually causing one of these thermostats to trip. Therefore, if one of these safety thermostats is tripped, a faulty operating thermostat could have caused it. I don’t see this very often but when it does it can be frustrating because the same thermostat you just replaced fails again. If your dryer is overheating causing one of the safety thermostats to fail your best bet is to replace the operating thermostat. Locator view for Whirlpool dryer models with the heater compartment on the back (back can be removed). 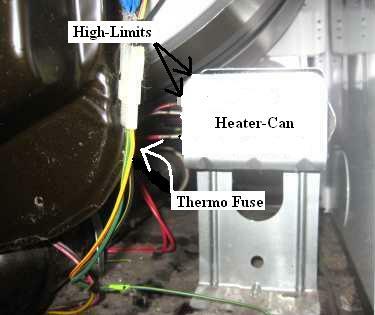 Locator view for Whirlpool dryer models with the heater compartment under the drum (back cannot be removed). The motor can cause a Whirlpool dryer not to heat, although I rarely see this. The motor has a built in switch that comes on when the motor get to full speed, turning the heater on. First unplug the dryer then take the lint filter out and remove the two screws that are under the filter. Then pull the top forward and lift up on it. The top should lift up, once up remove the two screws inside the case that point toward the front. Then lift up on the front and move it to the side. Now remove the tub by unhooking the belt by pulling the idler pulley toward the motor and this should release the tension from the belt then you should be able remove it. The tub just slides out toward the front. Once the tub is out, you should see the motor. There is no easy or safe way to check the motor switch because the motor must be running to check it. I recommend that you do not attempt to check this switch. However, most of the time if this switch is what is causing the dryer not to heat, then you can fix it by blowing the motor out an air compressor or if you don’t have one you can try a vacuum (the air compressor works better). If this doesn’t work and you still think that this is your problem (I can’t say if it is or not) then replace the motor. Dryer motors can be purchased at AppliancePartsPros.com. The timer can cause a Whirlpool dryer not to heat, although I rarely see this. The procedure for checking the timer varies with every model. But i can say that if you check everything on this page and don’t find anything wrong the timer is a good guess. Timers can be purchased at AppliancePartsPros.com.